For decades, the Sugar Bowl was the destination of choice for teams in the SEC. In the days of conference tie-ins and continuing into the BCS era, an SEC title meant a trip to New Orleans (or, for one year post-Katrina, Atlanta). Now, with the advent of the BCS National Championship Game and especially with the upcoming play-off and “Champions Bowl,” that isn’t always the case, but a Sugar Bowl berth will always represent a special season in this conference. 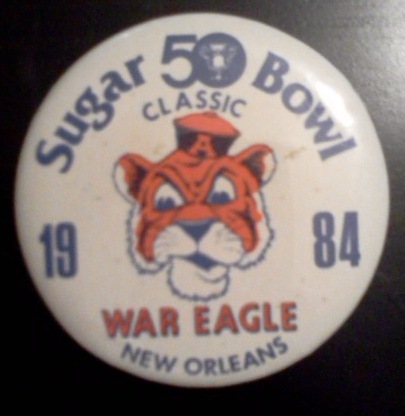 While the Sugar Bowl was celebrating its golden anniversary, Pat Dye’s Tigers were celebrating a hard-fought 9-7 win over Michigan in a game that should have earned the team a national championship (but I won’t get into that again). While the title eluded them, the legs of Bo Jackson and the leg of Al Del Greco had helped earn the Tiger’s their first Sugar Bowl trophy. This program, with more autographs than blank space, is a great memento of that historic moment in the program’s history. On a side note, I’m not exactly sure what the game had to do with basketball, regatta, road race, tennis, or flag football, but apparently you could read all about them inside. Also from that game, we have this excellent shirt and hat combo. 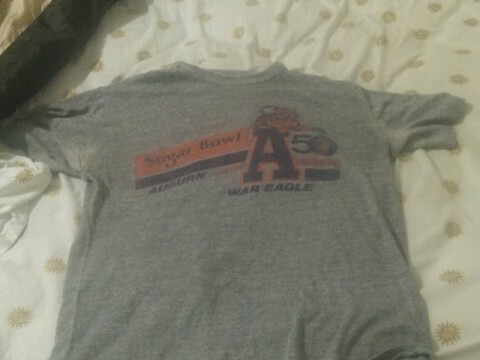 The shirt has held up remarkably well considering it is still a gameday staple, and I love the use of the pouncing tiger over the block A. The hat features the same image as the button above, but on a lovely, bright orange mesh that screams 1984 (in a good way). 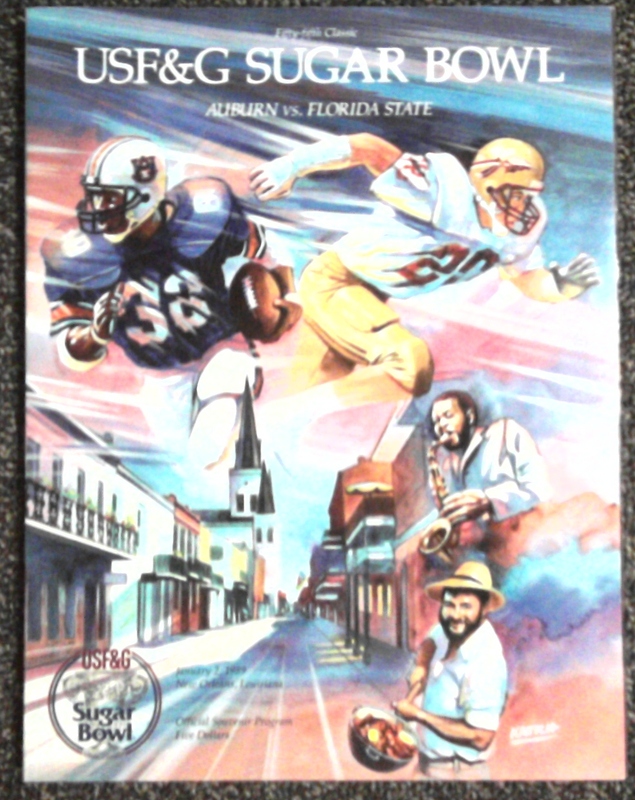 Auburn would next travel to New Orleans following the 1987 season and would leave with a 16-16 tie (or was it?) against Syracuse. The last second kick by Auburn didn’t sit well with the then Orangemen. Olin Buchanan of Rivals.com did a nice piece on Syracuse’s “enduring bitterness” over the tie back in 2006. In it he recounts the story of a Syracuse radio station sending Dye 2000 ties, all of which he subsequently autographed and sold to raise $30,000 for Auburn’s general scholarship fund. 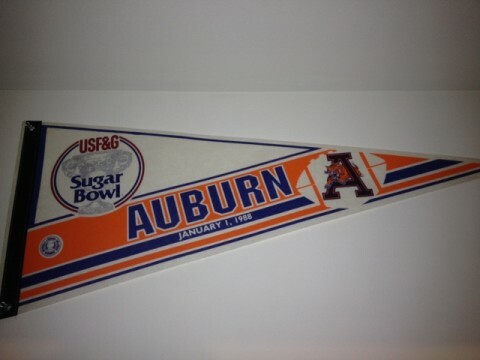 You can see by the pennant that the game is now the USF&G Sugar Bowl and not just the Sugar Bowl Classic that is was a few years earlier. 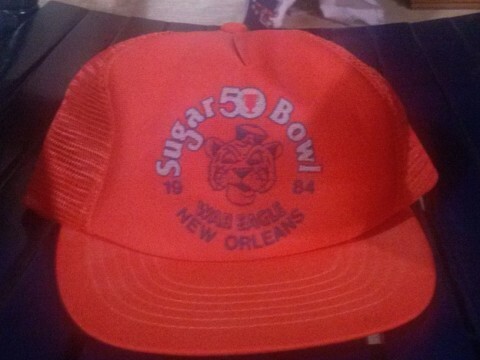 In my mind, it is still the USF&G Sugar Bowl no matter who the title sponsor is these days. Auburn may have lost 13-7 against Florida State in their return trip to the game the following year, but I have to disagree with Lonnie on one thing. I think this program’s cover is fantastic. The saxophone player, the guy with the pot of seafood, the watercolors, everything just works for me. That’ll do it for this week’s edition. Thanks again to all of our great contributors, most of who have appeared multiple times in the past. Their contributions of dozens of items have helped keep the coffers stocked with goodies that have helped inspire posts and fill out others. A hearty War Eagle to all of you. If you have something you’d like to share, please send it to me at [email protected]. You can check out older posts here. Previously: War Eagle Relics puts a ring on it.